Our Go Green Challenge officially kicks off on March 29th and lasts until Earth Day on April 22nd! Anyone! Everyone! We think that this is bigger than just a YMCA thing so if you’ve got friends that aren’t members that want to get our emails, have them sign up. We’re providing content for individuals of all walks of life. Whether you’re a parent wanting to engage your kids in the outdoors or you want to bring ideas on how to reduce waste at work, we’ll have tips and insight for you! Tons of stuff! A little vague but we’ll cover a lot of ground in our emails. Each week, you’ll get an email from us (be sure to check spam!) and inside will include tips and activities to try on your own. You don’t have to share how you’re making changes but we’d love it if you do! You can send us an email at blindsey@ymcaeastvalley.org OR tag us on Instagram or Facebook! We’ve found that quick challenges can motivate us to make genuine change. Our Challenge doesn’t require you to make drastic changes, though. It’s all about small steps to reduce your impact on the earth and its natural resources. Staying aware, learning what you can do, and then making these small changes is the point of the challenge. Joining is easy! Just fill out the form below and you’ll get an email confirmation from us within 24 hours. If the form doesn’t generate for you below, click here to be taken to our online sign up form. Meet Breann, our Outdoor Adventure & Recreation Director. Over the next few weeks, you’ll hear from Breann during our challenge about how to reduce your carbon footprint. 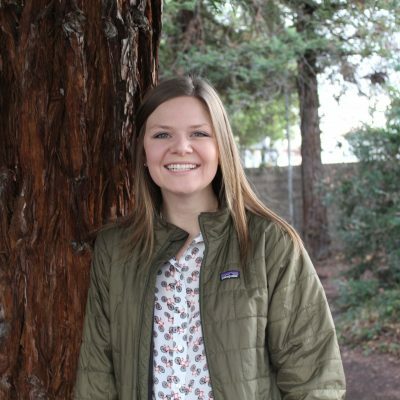 Breann joined the YMCA of the East Valley in January with many years of camp experience and a true passion for the outdoors. Having worked at camps across the country, Breann knows the importance in not only enjoying but cherishing the outdoors. With extensive knowledge on outdoor stewardship, Breann is thrilled to kick off our challenge and introduce many of our members to new ways they can cherish our planet. To learn more about Breann and her programs at Camp Edwards, click here. A greener planet starts with you. Reducing your carbon footprint and impact on our planet’s resources doesn’t have to be hard. At the Y, social responsibility is not only serving our community but serving our planet. Leading up Earth Day on April 22nd, we encourage you to join us as we learn about being better stewards. Our Go Green Challenge is a 4-week, email-based iniatitve that provides insight and information on how you and your family can reduce your carbon footprint and be better stewards of our planet. Led by Breann Lindsey, our Outdoor Adventure & Recreation Director, this free challenge will motivate you to make small changes that will create a big impact. Registration is ONLY available online but if you need assistance, swing by a YMCA branch and we will get you signed up.